Hearing loss can have a significant impact on your quality of life. Long recognized for causing increased stress, anxiety, irritability, and impaired personal relationships, recent research has uncovered even more serious conditions linked to hearing loss that researchers are just starting to understand, including links to Alzheimer’s Disease and mental decline. The fact is, there are major negative psychological, cognitive, and social effects that result from hearing loss if left untreated. These effects can inhibit a person’s communication ability so much that their professional and personal lives can begin to suffer. Alzheimer’s Disease – Alzheimer’s Disease and dementia, may see even more negative effects of these serious conditions when hearing loss is also present, according to a study from Johns Hopkins University and the National Institute on Aging. Depression and Social Isolation – U.S. adults of all ages and races with hearing loss are more prone to depression, according to the National Institute on Deafness and Other Communication Disorders (NIDCD). Impaired Memory and Mental Decline – People with hearing loss experience a 40% higher rate of decline in cognitive functioning compared to those with normal hearing, according to studies from Johns Hopkins University. Which means, your ability to reason, respond and stay engaged is diminished. Lower Household Income – In a survey conducted by the Better Hearing Institute, those with hearing loss were found to earn up to $12,000 less annually, depending on the degree of hearing loss. Those who wore hearing aids reduced this impact by 50%. In other words, if you experience hearing loss that could be treated with hearing aids and choose not to wear them, you could be costing yourself a lot in lost income. Increased Risk of Fall and Accidents – People with mild hearing loss are three times more likely to have a history of falling, with the risk increasing as the hearing loss becomes worse. The result is that you could find yourself in the emergency room more often and be more likely to be seriously injured. Additionally, hearing loss can make it difficult to hear car horns, ambulance and police sirens, fire alarms, and other alerts to danger, exposing you to an increased risk of injury. Hearing loss is also sometimes a symptom of a more serious underlying medical condition, such as blood vessel problems, infections, or tumors. While there are many dangers associated with hearing loss, the good news is that you may be able to help avoid, eliminate, or reduce these conditions by getting your hearing tested and treated. Clarity Audiology & Hearing Solutions, LLC provides hearing evaluations and hearing aid services to patients in Ellicott City, Columbia, Catonsville, Baltimore, Sykesville and all of Howard, Carroll and Baltimore County. 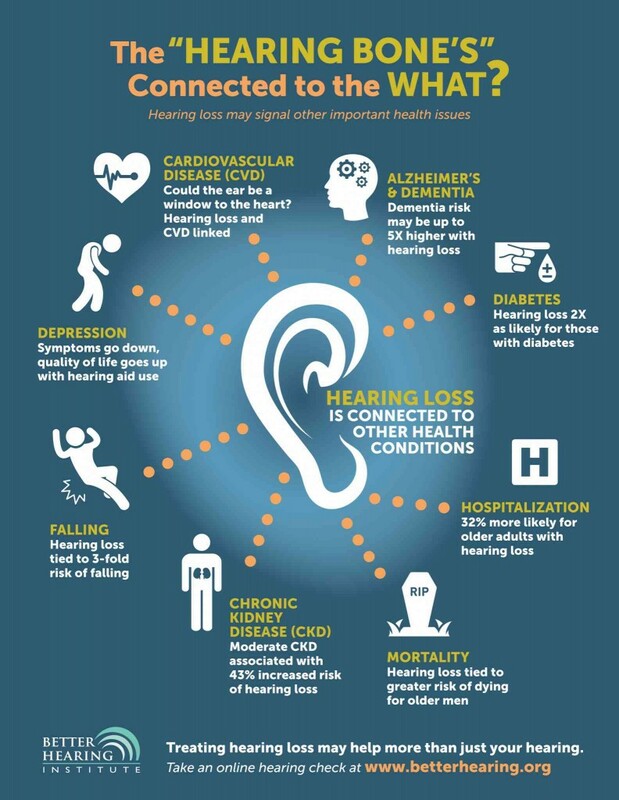 If you think you or a loved one suffers from hearing loss, call Clarity Audiology & Hearing Solutions, LLC at 410-698-6594 and take the first step towards improving your hearing and your life.